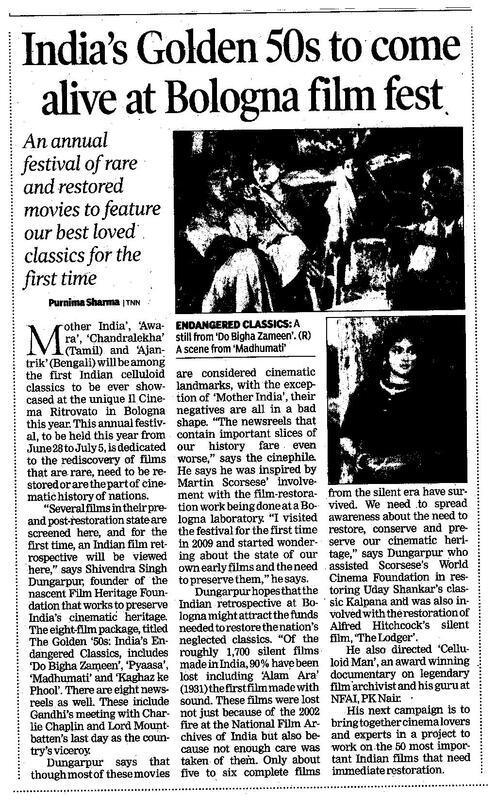 Times of India and Indian Express articles on a series of restored classic Indian films to be screened at this year's Il Cinema Ritrovato film festival in Bologna, Italy (June 28 - July 5) in association with Shivendra Singh Dungarpur's Film Heritage Foundation. Screenings include Bimal Roy’s iconic classic Do Bigha Zamin, along with Awara (1951), Mother India (1957), Ajantrik (1958), Chandralekha (1948) and Pyaasa (1957). Sad to report on the passing of the 'Celluloid Man' himself, Mr P K Nair who has died at the age of 82. This seems like such a completely perfect fit for Second Run, especially with its focus on the purpose of maintaining an archive, the focus not necessarily on being if a film itself is remarkable but maintaining a diverse catalog that really reflects the variety of films made both internationally and domestically, especially focusing on those that are under-served. I bought this on a whim in the Arrow sale a few months back just to put me over a shipping threshold, and spent the intervening time wishing I'd used my money on almost any of the other titles, but I just found this exhilarating. As is mentioned in pretty much all the reviews in the preceding few pages, it does somehow feel like it could continue going on for double the run time and still be bursting at the seams with juicy info.